Unfortunately, neck pain affects a large number of people, and the causes do not always seem obvious. Most of the time, it will be a self limiting process and will improve with time. Explanations of neck pain include arthritis, which is a degeneration of the bones and joints in the neck bones. The cartilage wears away, causing the bones of the neck to rub against each other. There are small nerve fibers located underneath the cartilage, and it signals pain. Any extra movement causes increased signaling. That is why the body will act to prevent these motions. Along with the pain signals, often, there are inflammation effects at the location of the degenerated bones. It cause a natural swelling of the area. That will cause an increased inflammation of the muscles and the tissues around that area. This also results in the nerves signaling pain. Over time, in most instances, the body will naturally decrease the inflamed areas, and there is recovery. To help the process along, physicians can recommend medications such as anti-inflammation drugs, and muscle relaxers. As in all medical situations, sometimes there are side effects associated with these medications, therefore cautions and warnings are always necessary with any intervention. Simple remedies such as ice to the inflamed area, gentle massage, and activities modifications can also help with the process. Neck pain can also be secondary to a pull to the muscles or ligaments in the neck. As above, this pull or sprain to the muscles causes an inflammatory reaction. And, most of the time, with the same techniques as listed above for arthritis, the pain from the muscle/ligament sprain/strain will resolve over time. In more serious situations, neck pain can be secondary to a more significant cause such as a pinched nerve from a disk herniation, or bone spurs. 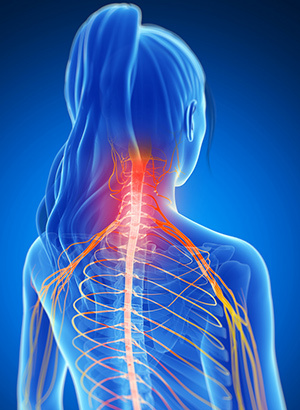 In this instance, there is neck pain along with associated nerve pain specific to the nerve that is pinched. Usually, it means a shooting, radiating pain to parts of the arm. There may be associated weakness of specific muscle groups as well as numbness to specific areas of the arm. If the pain is severe, or the weakness is profound, you should consider contacting your physician to make sure it is not a more serious condition. In rare instances, the process may not be reversible without medical intervention. Not to alarm anyone, but it some instances, neck pain can be caused by more serious conditions such as a broken bone, an infection or a cancer. If you have severe pain after some traumatic injury such as a fall, or an auto accident. You should contact your physician for an evaluation. If you have a history of prior cancer, fevers, or sweats, or other significant medical conditions such as diabetes, or immune-compromise, you should also contact your physician for an evaluation. In rare instances, the pain is also associated with loss of muscle strength, inability to walk, and/or loss of control of your bladder and bowels. In this instance, you should contact your physician immediately, and if there is and concern about the seriousness of the complaints, go to the Emergency Room for an evaluation. Fortunately, in most instance of neck pain, it is not a serious condition, and will improve with the above mentioned treatments, counseling and time. But, if you have concerns, your physician can counsel you on the possibilities as well as offer advice on how to prevent recurrences, or how to minimize the length of time of each episode of neck pain.